Owen James Gallery is pleased to present the work of China Marks. Born and raised in Kansas City, MO, the artist moved to New York in 1976. Originally working in sculpture, over the years the artist’s practice has transitioned to fabric-based constructions. China Marks is known primarily for her large format drawings, which can best be described as fabric collages. Source materials include old commercial tapestry reproductions of art historical paintings, bits of odd found fabrics, embroidery and ephemera. Over many weeks these materials are cut, formed, added, removed and completely transformed again and again. The result of these laborious processes are characters and creatures that inhabit surreal, fantastical landscapes. With the addition of humorous text (also sewn into the work) these drawings combine the beauty of assemblage with a fascinating un-reality redolent of Terry Gilliam’s animations for Monty Python. Presented here for the first time is a subsect of the artist’s practice culled from both her “Broadsides” and “Short Subjects” series. Marks has developed this ongoing series over the last 3 years. Smaller in format, these drawings stand apart from the dense construction of the larger works. The Short Subjects are made on a white or off-white ground. Initially intended more as thought-pieces, or visual proverbs, they have developed into their own visual system. Marks begins each Short Subject with a scanned line drawing, and this digital file is then processed through CAD software. A computerized embroidery machine sews out an approximation of the drawing in a running stitch on fabric. The artist then builds upon the design with additional fabric pieces and embroidery. Sometimes parts of the original drawing will be covered over, sometimes enhanced or twisted into a new character all together. 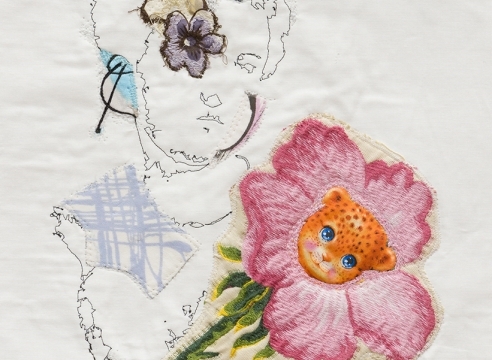 As the artist forms and reforms the images, a story or situation develops in her mind, and phrases and conversations that arise are also digitized through the computerized embroidery machine. These are then sewn into the work, sometimes with the addition of found objects or trinkets, and the scene is then set. These text components are full of witty, sometimes naughty, delightfulness. Examples include: “I am going to Hell at a local motel. And I’ve packed accordingly” and “Heard about the psychotic squirrel who thought he was a washing machine?” The title for each work is separate from what is read within it, and providing accents of poetic nomination. “All Kinds of Lost”, “Winter Comet” and “Better Living Through Chemistry” are representative of these features. Interacting with the Short Subjects are a number of pieces from the Broadsides series. Similar in scale, the Broadsides are streamlined and primarily text-based with occasional illustrations. Although the narrative image here is now mostly placed in the mind, the situations are equally humorous, poignant and unique. In one, a man wears clown pants and 4-inch heels to his mother’s funeral. In another, a woman has wings for arms but chooses to walk everywhere instead. A third component of the exhibition comes from the artist’s series of fabric-based artists books. These beautiful, sculptural books contain the much of these same image-density of the larger tapestry-based drawings. In A Book of Horses, highly decorative landscapes of old British fox hunts contain riders with duck heads and horses with tiger legs. Larger figures and insects hover over the landscape like something out of an ancient Greek myth on acid. However, this is a book without words, and the silence of the scenes offers a contemplative counterpoint to the witty and zany world around it.